171968 Colour Sergeant Robert Edward Elgin Moore was born 9th November 1858 in Norfolk County, Ontario to Robert Leeper Moore and Maria Ann Moore. Robert Leeper Moore was born in the United States in 1817, he is thought to have escaped from Kentucky and lived as a Free Black in one of the northern states because he was described as well educated and in possession of a copy of “Wesley’s Sermons”. He arrived in Canada around 1851. Robert and the Ontario-born Maria Ann Bush were wed and farmed in Cayuga township, Haldimand County. Robert E. E. Moore appears to have moved to Hamilton by 1881 and became a Tailor. On 26th April 1882 he married Mary Priscilla Griffin in Ancaster Township near Hamilton Ontario. At some time before 1882 they moved to Toronto and in 1884 had a son Robert Anderson. 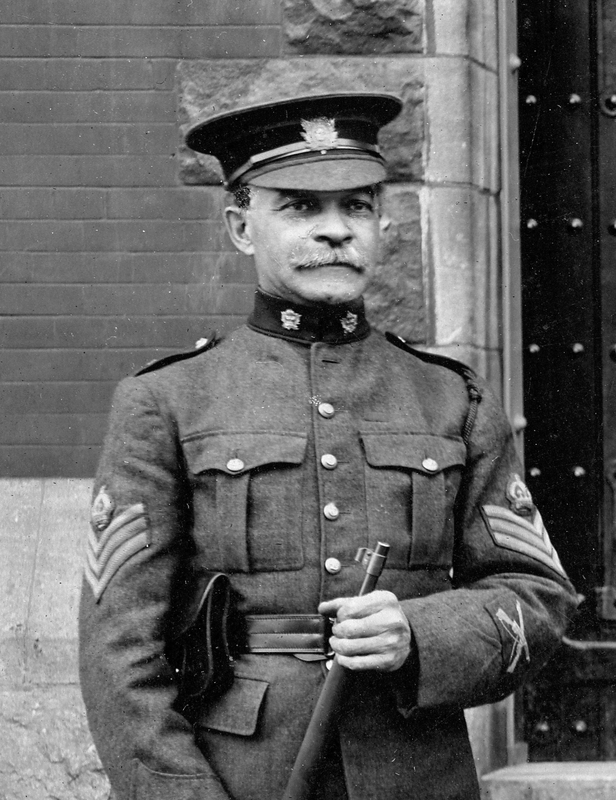 By 1892 Robert had joined the Queen’s Own Rifles in Toronto as a Militia soldier. He appears in numerous Pay Lists as belonging to number 2 or “B” Company. By 1905 he is promoted to Sergeant and by 1909 he is listed as Colour Sergeant which is the senior non-commissioned soldier of his company earning 85 cents/day. In 1910 he accompanied the regiment on its trip to England to take-part in maneuvers with the British Army, he can be seen in at least two photos of the trip. 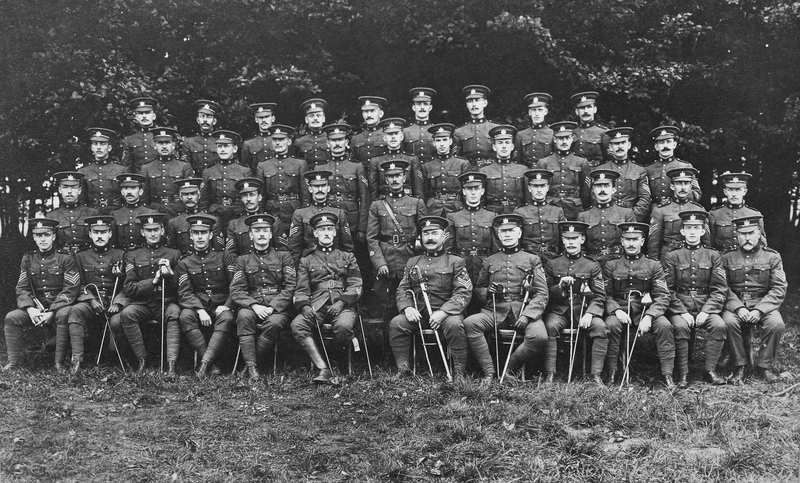 Robert must have become an accomplished shooter; in 1913 he can be seen in a photo as team Captain of the “B” Company shooting team having won the Brassey Cup. 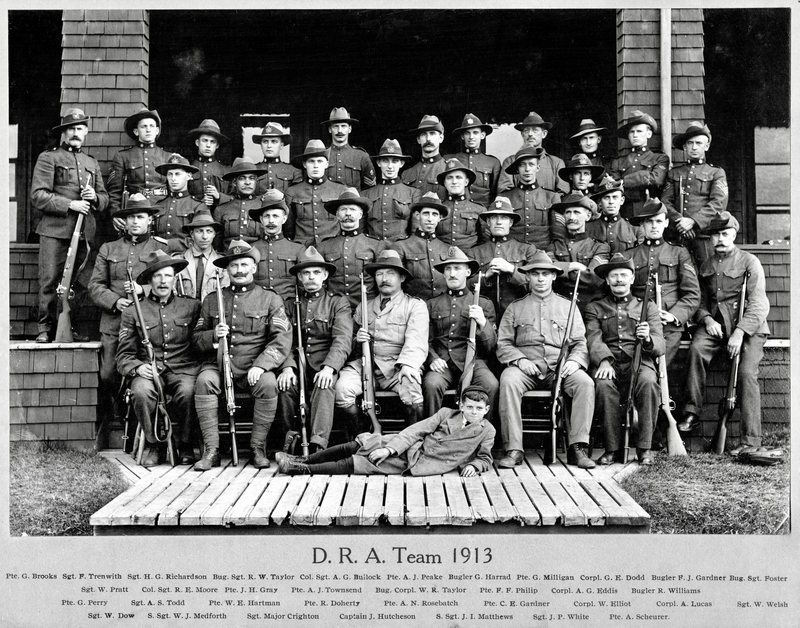 He was also a member of the QOR Dominion Rifle Association Team and the Maple Leaf Club beginning in 1914. On 18th August 1915 Robert volunteered for Active Service with the 83rd Battalion (Queen’s Own Rifles) of the Canadian Expeditionary Force. At 56 he was well overage for service in the war but he may have been exempt due to his tailoring skills, on his documents he is listed as Sergeant, Master Tailor. Robert arrived in Liverpool, England on the SS Olympic 7th May 1916, he appears to have been posted to a few units in England before returning to Canada September 1917 possibly due to Mary being gravely ill, she died the same month he returned. After further service in Canada he was discharged from Active Service 31st July 1919 at the age of 60 years, 9 months. Although too old to return to the Militia it is known he attended at least one meeting and shoot with his old comrades at the Queen’s Own Maple Leaf Club. He died in 1921 and is buried in Mount Pleasant Cemetery in Toronto with Mary.